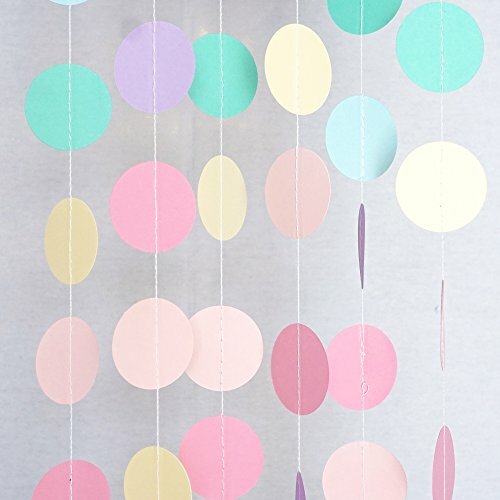 These paper circle garlands are a great way to spice up, decorate, and impress at any event, be it baby showers, birthdays, weddings, bridal showers, or any other themed parties you can imagine! Use several of them together in one area hanging down, or from side to side to bring pizzazz to your party. Popularly used as a photo booth backdrop or photo backdrop. NOTE: Garland can tangle during unrolling- be careful to slowly unroll garland. Do not let babies or small children play with garland. Use for decorative purposes only. Not a toy. GREAT VALUE & OPTIONS GALORE: Choices are great! The more you purchase, the more you save. Garlands are sold in packs of 1, 4 and 10. Each package comes with one 10-foot garland. The 4-Pack comes with four 10-foot garlands. The 10-Pack comes with ten 10-foot garlands.